Posted on February 24, 2016 by Hillary T.
We are pleased to share a guest blog post from Lorna Gibson, Mass Audubon Council member, longtime Leadership Friend, and Tern Society member. Lorna is also Matoula S. Salapatas Professor of Materials Science and Engineering and MacVicar Faculty Fellow at MIT. 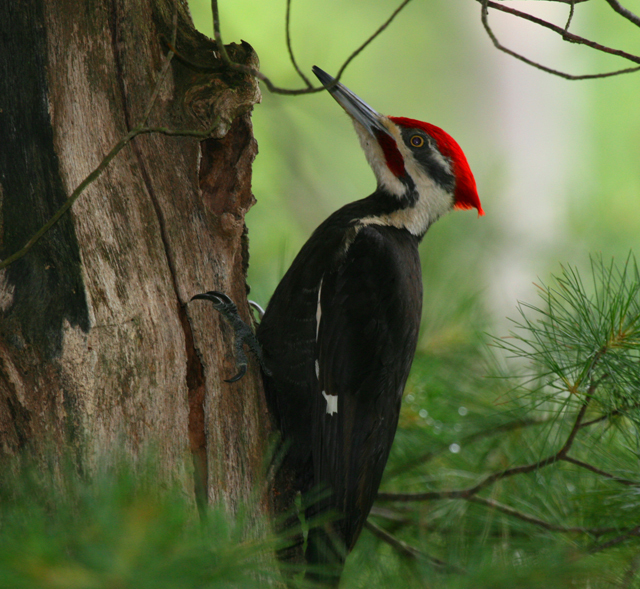 A couple of years ago, Lorna came to Mass Audubon headquarters to share what she was learning about woodpeckers and how they withstand the impacts of constant pecking. Now, thanks to the incredible videos put together by Lorna, co-producer Caitlin Stier, and a team of others at MITx, MIT’s online education department, everyone can enjoy and learn from her work. I love birds and I love teaching. And I’ve now combined these two interests in a new, eight-part, short-form video series: Built to Peck: How Woodpeckers Avoid Brain Injury. The series, designed for a general audience, is like an online fusion of “Nature” and “Mythbusters,” weaving together intimate observations of bird behavior and physiology with engineering “explainers.” The project was a collaboration with MITx, MIT’s online education division, and, in particular, with one of their media specialists, Caitlin Stier. A number of years ago, a colleague told me that woodpeckers have a special foam-like material between their brains and their skulls that protects them from impacts during pecking. Since I study the mechanical behavior of foams and foam-like materials, I had to look into this. Once I sorted out an explanation (there is no special foam-like material involved) I started giving talks on how woodpeckers avoid brain injury to birding groups and audiences interested in natural history. So when the opportunity to make a high production value video with MITx on this topic arose, I was thrilled. We set about translating my talk into a lively exploration of the engineering, biology, and natural history behind woodpecker pecking. After storyboarding to determine the best mix of on-camera presentation, graphics, historical and new footage, our team began filming in late July and August. We were permitted to shoot in Harvard University’s Museum of Comparative Zoology, where we peered into drawers containing centuries-old and often rare bird species, well preserved and fully feathered. Another highlight was shooting at the lush Hall’s Pond Sanctuary in Brookline, near the 19th century home of Mass Audubon co-founder, Minna Hall; the final segment in the series gives a behind-the-scenes look at the founding of the Mass Audubon. — Professor Lorna Gibson MacVicar Faculty Fellow and Matoula S. Salapatas Professor of Materials Science and Engineering, MIT. Adapted from Built to Peck: How Woodpeckers Avoid Brain Injury, from the MIT News Office. This entry was posted in Nature Notes, Stuff We Love on February 24, 2016 by Hillary T..